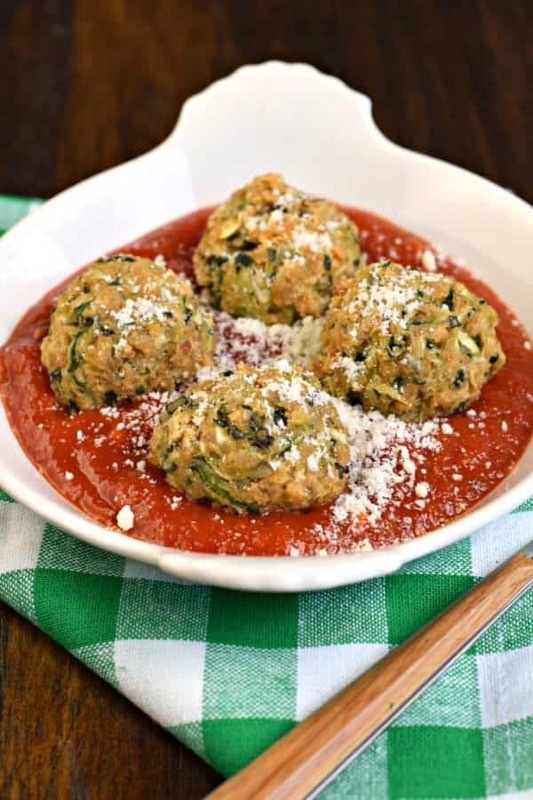 You’ll love these meatless, easy, healthy, vegetarian Zucchini Meatballs for a delicious dinner! Serve them up with your favorite pasta sauce and noodles for a dinner your friends and family will love! We are now nearly one month into this vegetarian lifestyle, and you guys, I feel amazing. Cutting out most meat (I still do eat the occasional seafood…so basically I’m a pescatarian), has been quite easy as of now. We’ll see how I feel come Thanksgiving with no TURKEY! That said, using fresh vegetables and herbs from my garden has made these even easier. Planning meals is still tricky, as I try to include meat several days a week for my carnivorous husband and children…but me and the youngest are doing quite well. She is very helpful in the kitchen too! 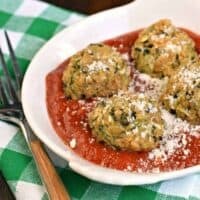 One recipe that has had my eye for quite some time is a recipe for Zucchini Meatballs from Skinnytaste. Have you seen these yet? I wasn’t so sure about trying them, up until now. 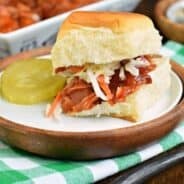 When I’m ready to try any sort of meat replacement (say hello BBQ Jackfruit Sliders)! Remember last week when I told you I had several zucchini recipes in the works? 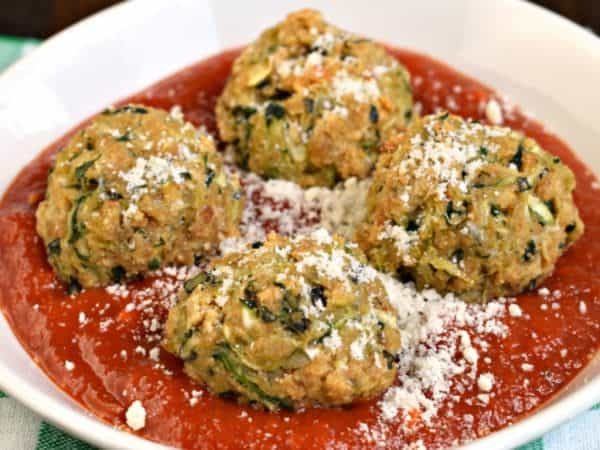 In addition to Lemon Zucchini Bread, today’s Zucchini Meatballs recipe topped the list of things to share ASAP! So here’s what you want to ask me: DO THEY TASTE LIKE MEAT? No. They don’t. I’ll be honest. However, they taste delicious. 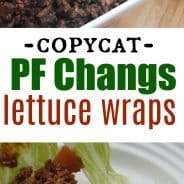 And when you pile them on a sub or a plate of pasta, these are a great low calorie, healthy alternative that truly tastes good. I shredded my zucchini with my food processor, however, you can even toss it into the food processor for a second ROUND, making it even finer. I don’t mind the shredded zucchini, however, I know my kids prefer it to be not as noticeable when you take a bite. 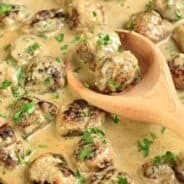 The texture of these meatballs is wonderful. The breadcrumbs help hold them together, and baking them browns them up slightly. If you prefer them even more browned. You can flip them over after the 20 minutes, and brown them on the other side for an additional ten minutes. It will also dry them out even more, giving them a chewier texture. Do not skip the first step of sauteing the zucchini and garlic. This cooks the zucchini to a more tender texture, and infuses the garlic into the zucchini. Do not skip the draining process either! Using a colander or even a clean towel, you’ll want to press out any extra liquid. Otherwise you may find yourself with some soggy meatballs that fall apart! I use a 2 Tbsp scoop to make my perfect meatballs. Scoop the “meat” then use your hands to press and roll them into a ball. 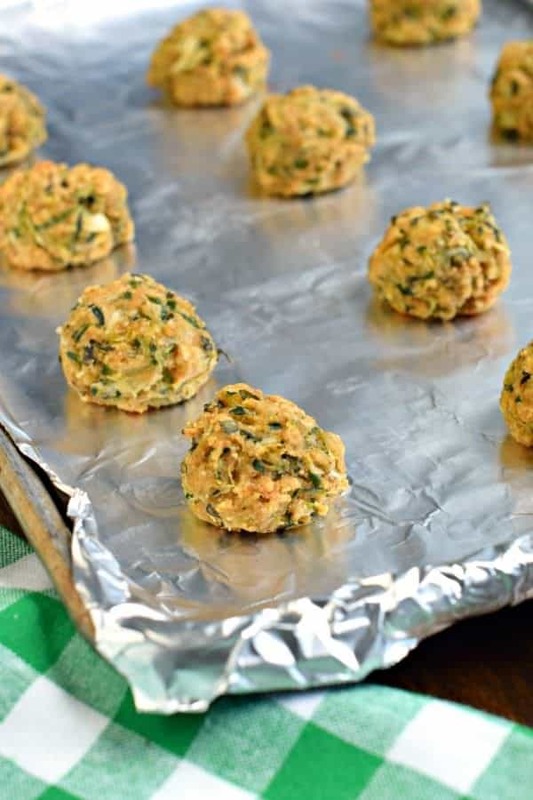 Place them on a foil lined baking sheet (I love the Reynold’s Non Stick Foil for this)! Once these are cooked, add your sauce and enjoy warm. OR, let them cool, place them in a freezer safe ziploc bag and freeze until ready to use! Each batch makes about 20 meatballs. 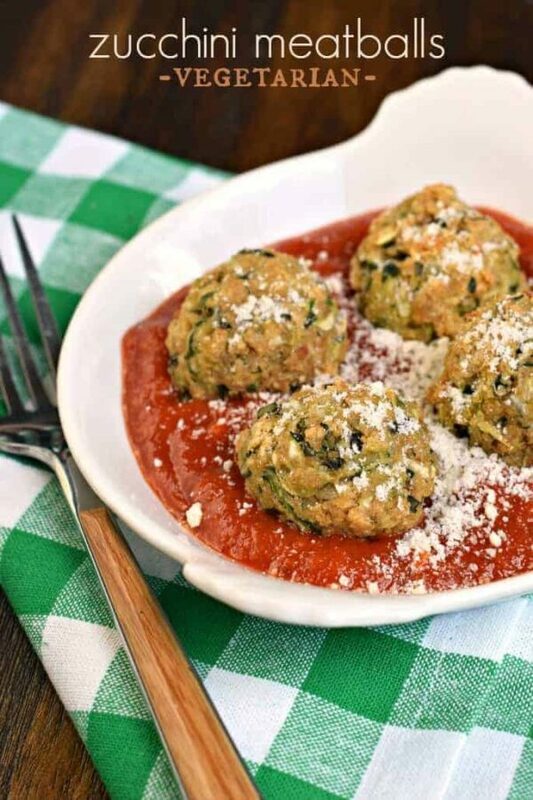 You'll love these meatless Zucchini Meatballs for a healthy, fresh vegetarian dinner! Serve them up with your favorite pasta sauce and noodles for a dinner your friends and family will love! In a large bowl combine bread crumbs, egg, seasoning, basil, and parmesan cheese. Mix with the zucchini until fully blended. Serve meatballs with your favorite sauce on pasta, zoodles, or a hoagie with cheese! ENJOY! Looking forward to making this variation of how I have been using up my zucchini. Did you use fresh or dry bread crumbs? I used dry because I was afraid fresh would add too much moisture (and the zuccchini already has extra moisture). I would say if your fresh breadcrumbs are pretty moist (ie FRESH), maybe leave out the egg? Let me know if you try it! Can egg be skipped to make it real vegetarian? Many vegetarians eat egg…but if you prefer to leave it out, feel free! You may need to add a splash of water to help bind it together. I’ve been looking forward to seeing this recipe. I have a garden full of zucchini, so it’s much appreciated. I wonder if the uncooked “meatballs” will freeze well. I’m going to give it a try…wish me luck! Made these today and they are delicious. We are whole food plant based so I made a flax egg and used nutritional yeast. Thank you for the great recipe. Zucchini is so good and it’s terrific to have another way to use it. great tips, thank you 🙂 Glad you enjoyed the recipe! Used egg replacement ( aquafaba ), 3 in total, and baked a little longer. A dash of hot sauce and maybe 1/2 tsp onion powder. Great! The zucchini meat balls where delicious. I used nutritional yeast instead of cheese to bake the vegetables meatballs. Nutritional yeast is a great addition!